Substitute Pac-Man here for Rollercoaster Tycoon and then this would be me. Computer Game History - Part I: Waaaaay before Pong. The History of video games doesn't just stretch back to Pong and the 70s/80s uprising of arcade games, it goes further back than that, way back. To understand the history of games we must understand the history of how they came into being and the only way we can do that is through looking at the history of computers themselves, lets start with a man called Charles Babbage. In 1822, Charles Bubbage designed the difference engine. Used for automation of creating mathematical tables, this machine was beyond its time and wasn't fully constructed within Babbage's lifetime. Modern computers still use its basic foundation of being able to program in a routine and get an output. Babbage couldn't construct the difference engine in his own time because they didn't have lego back then. 1939. This kickstarted the company which has later gone on to lead many of the major innovations in computing. Hewlett, W.R. (1939). Variable Frequency Oscillation Generator. United States Patent Office: United States Patent Office. The first half of the 20th century were known for their straight to the point naming of things. Following in that tradition I present to you the 'Cathode Ray Tube Amusement Device' from 1947, which is known to be the world's first electronic game. 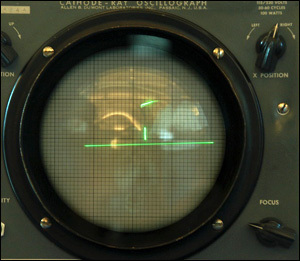 The game takes advantage of a oscilloscope screen to display targets, while the player fires missiles at them in a similar vein to the military radars at the time. It is a purely mechanical device and has no memory, programming or computer generated graphics but still it is an important milestone. Noob. Look at him camping. Jumping ahead to 1958 we have the Sage lightpen which was a revolution in input devices. The light pen worked in conjunction with the screen to work as a pointer, this was something that video games have adapted later down the line as the basic controls of arcade shooters and input accessories for consoles. It is also easy to compare this to the pointing functions later on used in the Nintendo Wii and the Playstation Move.